On Tuesday [March 1], environmental activist Stuart Hayward spoke to the S1 assembly at the Berkeley Institute, touching on a personal story of a good Samaritan — who attends the school — in order to encourage positive social behaviour. Mr. Hayward’s speech to the attentive students included his view of sustainability in five forms, including physical, social, political, economic, and cultural, with his view of the social aspect of that equation focusing on S1 student Zeico Swan, who had recently assisted Mr. Hayward following a fall from his cycle. The activist told the students the story of the accident, which took place in December, which ended with him on the ground after the fall. S1 Berkeley student Zeico Swan witnessed the accident and immediately came to Mr. Hayward’s aid, helping him to stand, ensuring that he was not seriously hurt, and tending to his bicycle. Mr. Hayward applauded this act of good citizenship, noting that the student could have passed him by, but instead chose to stop and help. 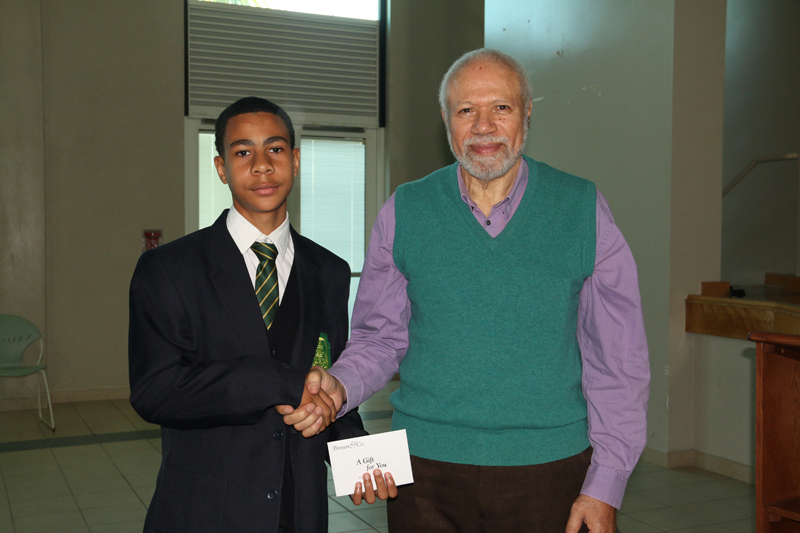 Mr. Hayward presented Zeico with a gift and presented the school with a copy of his book, Bermuda’s Delicate Balance, for the Berkeley Institute library, with the students in attendance applauding Mr. Swan’s positive effort. Two great acts of humanity.. Well done Zeico for not passing by and helping and well done Stuart for showing it was appreciated and making a lesson out of it. This is what we need. Give the public all the positive things that are happening with the Berkeley students. Folks will soon discover that there is more positive than negative events taking place. We need to hear both, mind you. Great job Zeico and Stuart thanks for recognizing him. I am proud to be Bermudian reading a story like this. Mr. Swan is well on his way to being a great person and Mr. Hayward… well you already are!